Outdoor post lantern in astral bronze and clear seeded glass. This transitional style exterior light also comes with other matching outdoor light fixtures for your home. Post and/or pier mount are sold separately. 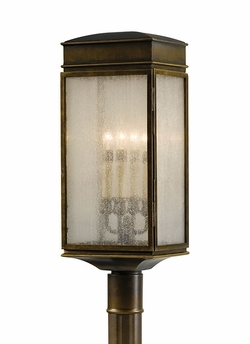 Height: 24.75" - Width: 9" - Length: 7.3/8" - Bulb: 4 x 60W Candelabra Base.